POINT PLEASANT, W.Va. — Safford, Richardson and Cromley. Those were the coaches involved the last time Mason County found its football teams without a win through two weeks of the regular season. Fortunately, a dubious streak that dates back to the 2006 campaign was extended by at least another year. 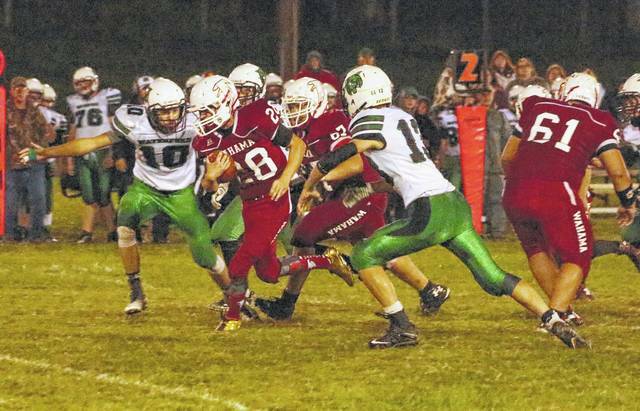 Wahama suffered a setback in its TVC Hocking opener, but Point Pleasant picked up a big road win at James Monroe in a pair of Week 2 contests Friday night involving Mason County squads. The Big Blacks rebounded nicely from having its 43-game regular season winning streak snapped last week after rallying back from a 14-7 halftime deficit to claim a 20-14 triumph against the Mavericks. JMHS knocked Point out of the playoffs last fall. The Red and White also snapped a two-game losing skid with avenging decision. PPHS last started a gridiron season 0-2 back in 2007, which coincided with current head coach Dave Darst’s first year. The White Falcons lost 27-0 to visiting Waterford at Bachtel Stadium, which marks the first time since the 2006 season that the Red and White are 0-2 to start the season. The Wildcats will be looking to start the year .500 for the first time in three years as their game with Green was postponed until Saturday afternoon due to weather. Due to an early deadline, the Mason County football openers from Week 2 will be available in full detail in the Tuesday sports edition of the Point Pleasant Register. Game stories will be available online at mydailyregister.com before appearing in print. Wahama senior Colton Arrington (28) runs through a hole against the Waterford defense during the second half of Friday night’s Week 2 football contest at Bachtel Stadium in Mason, W.Va.